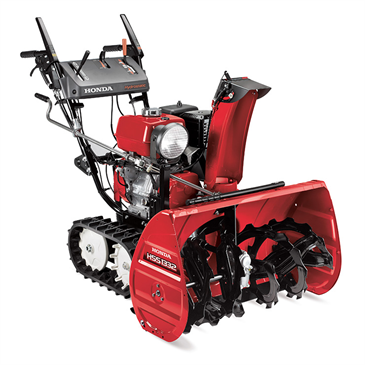 This snow blower from Honda is another one of the variable speed hydrostatic transmission types that allows the operator to mach the ground speed with the snow load and enables throwing snow up to 56 feet away depending on conditions. They claim you can remove up to 65 tons of snow an hour which is pretty amazing. Most consumers do not have that much snow to clear! This machine comes with tracks instead of wheels to provide maximum traction in all conditions. Operators can clear 32 inches wide at a pass making this machine very efficient in clearing snow from long driveways or large areas. It also comes with a work light for night time operation. The one negative about this particular machine is that it does not have an electric starter. Operators must start it using the standard recoil starter by pulling on a starter chord. They do claim they have an easy start engine. Operators can operate the snow blower by one hand while adjusting the chute direction with the other hand. This is a great advantage when you want to minimize your time blowing snow and do not want to stop to adjust the direction that you are blowing snow. We find this Honda snow blower an excellent snow blower and they are currently listed for $4199. It comes with a 36 month warranty for both residential and commercial operators which is unusual in the industry. Most commercial warranties are much reduced compared to residential warranties. Transmission:The transmission is a hydrostatic transmission (HST) which provides an infinitely variable speed capability to match ground speed with snow conditions. Warranty: This Honda snow blower comes with a 36-month, non-commercial use and a 36-month, commercial use distributor’s warranty. This Honda snow blower is an ideal machine for consumers and snow clearing companies to utilize to quickly clear large areas of snow. Whether you have a long driveway or a large parking lot to clear, this particular machine can make quick work of it. With a powerful engine and clearing 32 inches in width at a time, it does not take long to clear a driveway that might be 10 feet wide or 120 inches. Four passes along the driveway and your done with a 32 inch swath each time. This snow blower is an update of an earlier model and many specifications have been updated to provide improvements. Honda claims that the Honda Snow Blower HS1332TC is all new from the ground up with many changes. Consumers may want to compare all of the features prior to making their purchase. Arrangements for delivery will need to be made for this snow blower due to it’s size and weight. this weblog and I am inspired! Very helpful info particularly the ultimate part 🙂 I maintain such info much.